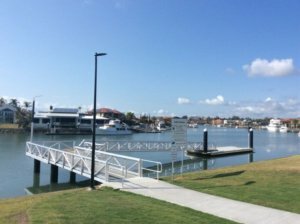 Redland City Council has completed a new purpose built canoe and kayak launching pontoon at Raby Bay Esplanade Park, Ormiston. Redland City Mayor, Cr Karen Williams said the $600,000 pontoon construction project, opened today with the removal of bunting, will cement Redlands Coast as the region’s premier canoe and kayaking destination. “This new bespoke Disability Discrimination Act (DDA) compliant pontoon will be the premier facility among 58 canoe launching points already identified along over 300 kilometres of Redlands Coast,” Cr Williams said. “The completed pontoon work includes new pathway connection and lighting. “Work will now be undertaken in coming weeks to connect up the wash-down plumbing, and construct a concrete pad and rail to allow users to secure their canoe trolleys while on the water. “First identified in the master planning for Raby Bay Esplanade Park, the design and construction of the new facility was managed by Council, after stakeholder consultation to ensure the finished design would meet all community and user requirements. Divisional Councillor Wendy Boglary said the new facility provided safe access to the calm and protected waters of Redlands Coast that were perfect for seacraft exploration. “Ormiston and Wellington Point are hosts to diverse natural habitats and the new pontoon will make it easier for kayakers and canoeists to get up close and personal with dolphins, dugongs, sea turtles and sea birds,” Cr Boglary said.